Located on the east end of the island of Maui in a little town called Hana, our ten acre farm sits in the middle of a tropical forest with lush rainfall and glimmering sunshine all year round. It is the perfect climate to grow and cultivate tropical flowers from which we make our beautiful bouquets. 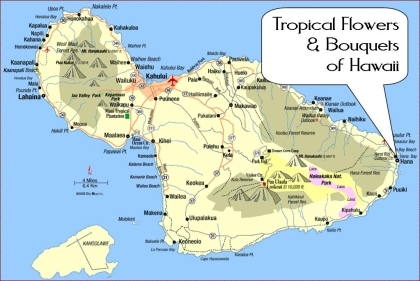 Tropical Flowers and Bouquets of Hawaii does all the growing/farming and sales portion of our business. We select our best flowers to send out in our bouquet gift boxes. Freshly picked, the flowers go through several stages before they are packed into the gift box. We sort all the flowers to separate out the best, then washing and cleaning are done to make sure that there are no insects or debris. The flowers are then moistened with a spray mist to ensure long life and then put into the gift boxes as your bouquet.